I recently gave a lightning talk at a local meetup about HLS (HTTP Live Streaming). I have been making demonstration HLS players for Android, iOS and the browser recently. The presentation is now available on slideshare. The slides are also embedded below. Reviewers are merciless for Apps that crash. Let’s talk testing. By my definition of done, your Android App isn’t complete until it has been tested. Not only is it irresponsible to publish an App to the play store without testing it, reviewers will have no mercy if you have a crash prone App. Programmer beware the null round. Java is a belt fed 240G automatic weapon where sometimes the belt has rounds, sometimes it doesn’t, and when it doesn’t during firing you get an NullPointerException, the gun explodes and you die. Imagine yourself staying up late at night, after the kids have gone to bed, working on some new feature for your App. You put the finishing touches on the code, unit test it, generate a signed release build and completely uninstall and re-install the App for testing on a real device. As soon as you try the new feature in the release build you get the dreaded “Unfortunately, App has stopped” error message. This all too common scenario is most likely caused by a Null Pointer Exception in Java. It is very frustrating when this happens, but because you tested on a real device, at least it happened to you and not your customers. Catching these kinds of errors is the primary reason to always test your App on a real device. Real devices running a fresh install of a release build often uncover errors that don’t show up in the Android emulator. Is it the Android developer’s lot in life to have a lot of test devices? If you already have an Android phone or tablet, great. You have everything you need to get started. I only used one Android phone for the first year that I had Apps on the play store. I also had a colleague at work who would run pre release versions for me on his Android phone. Testing on this additional device provided an extra sanity check. If you don’t already have an Android device, I find the best place to buy one on a budget is from eBay. I have bought two used phones from eBay for testing purposes. I can offer you these tips when buying a used device from eBay. You don’t necessarily want the cheapest device listed on eBay. Be careful to avoid nonworking devices being sold for parts. Don’t buy a phone that is listed by a parent of a teenage girl who has worn it out through constant texting. The most recent test phone I bought on eBay cost $24 delivered. 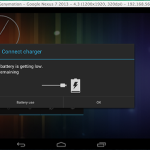 This low cost device is also running Android 4.0, an older version of Android at this point. This allows me to make sure that my Apps will run on low end devices. You may also want to consider buying a pay as you go phone. I have seen low spec devices go for as little as $49 at my local electronics retailer. Finally, there is a market place called swappa that offers used Android devices. In my experience, swappa has higher prices than eBay. They seem to offer higher end devices in good condition. I haven’t actually purchased anything from swappa because the devices from eBay met my testing needs. With the multiplicity of Android devices being created, it is not feasible to have on hand every configuration of every device. Remote testing services have arisen to address this problem. Some of these remote services, such as the offering from Samsung are free, others are paid. I have not needed to use these services personally but it is good to be aware that they exist. It may help you fix a bug that happens on an uncommon device in the future. One final note on testing with a real device, be aware that you can debug your Android App over WiFi. This can be helpful in situations where you can’t use a USB cable for some reason. Connect your device to your development machine and then follow these instructions for testing over ethernet. I appreciate the ability to debug my Apps in a graphical debugger where I can step through code and examine the reasons for a crash. This convenience makes your life easier as a Android developer working on a side project. An App isn’t finished until it is tested. You should test your App on a real Android device because you will catch errors that don’t show up in the emulator. If you need to buy a test device on a budget, I recommend eBay. The Android emulator is great for getting started in Android development. It is convenient that when you download the Android SDK for Windows, Linux or Mac that you get everything you need to start building your first App. This ease of use comes at a price. That price is the painfully slow performance of the emulator. Genymotion offers a faster Android emulator. The first evidence that the Android emulator is a pain point is the existence of a business that solves the pain. That company is Genymotion. This company exists to make a better emulator and thus make the Android development experience better. They offer a free tier that will meet basic development needs. I haven’t personally used their product but I can tell a story that drove the point home for me. I was talking to someone that was teaching an Android programming class. It was his first time teaching the course. He thought that the emulator would be good enough to use for the duration of the class. On the second day of class, one of his students suggested using Genymotion. The entire class of new Android developers switched over and never looked back. People tend to avoid doing things that cause pain (including but not limited to: banging your head against a brick wall, running ClearCase on Windows, and of course running the stock Android emulator). This is the second sign that using the Android emulator is painful. Just try to find a developer that actually uses it. Using an actual device for development, testing and debugging is faster and more convenient than using the emulator. I can’t remember how long it has been since I used the emulator. These days the only reason I use it is to generate screen shots for devices that I don’t own. The emulator is good for this purpose, even if it is slow to boot and use. Microsoft made their own Android emulator. In a surprising bit of news, Microsoft has entered the Android emulator arena by offering their own version in the latest version of Microsoft Visual Studio. I don’t know if Google has taken notice of this development but I have. In my experience, Microsoft Visual Studio is the best IDE available*. The major draw back to Visual Studio has been getting locked into the Microsoft eco system. It seems that there has been a strategic shift on the part of Microsoft to win developers over to their platform by opening up. I have been trying to resolve the cognitive dissonance of Microsoft offering tooling to support another company’s operating system. The best explanation I have found so far is the rumor that Microsoft makes more money on licensing patents for Android than on Windows phone. A very thin explanation indeed. The Android emulator makes it easy to go ahead and and get started developing an App. Once you start to notice the pain of using the emulator there are alternatives to make your development workflow better. These include using an actual device, Genymotion and now Microsoft’s offering. *IDEs I have used include Texas Instruments Code Composer Studio, Jet Brains IntelliJ IDEA, Wind River Tornado, Apple Xcode and Eclipse. The great thing about Android App development is that it is easy to put your App in people’s hands. When you do, resist the urge to tell them how to use the App. Observe what they do and what they try to do. Are they trying to interact with the App in a way you didn’t anticipate? Ask them what they are trying to accomplish. Ask what features they would like to see. 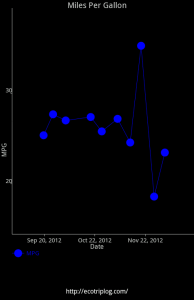 Mileage over time in Eco Trip. It was very exciting when I got my first App up and running. It was cool to be able to write a program that runs on the touch screen computer that you carry around in your pocket. I had to show it to my friends. That is when the feature requests started and that is a good thing. If you don’t provide too much direction and ask open ended questions, these demos can be useful brainstorming sessions for the future of your App. One of the main components of my first App was the graph of gas mileage over time that was suggested by one of my friends. This mileage chart is in fact one of the key differences between the App and the paper log I used to keep. In addition to making it easy to actually calculate the mileage, the technology enabled the ability to keep a chart. Not something I would do other wise. I have already mentioned how demonstrating your App to other people can give you lots of feature requests to consider. However, it is important to start talking to people even before you have an App that is far enough long to demonstrate. Once you start developing an App and telling people about it, you may find some of your friends and colleagues have experience making Apps as well. That is exactly what happened when I began telling people I was working on an App. A colleague from a past company told me about the App he was working on. He was a lot further along than I was and was able to offer valuable feedback. It was at his suggestion that I started using the Action Bar via the Action Bar Sherlock library. If I were to start a new App today I would target 4.0 as a minimum and the Action Bar Sherlock back port would not be needed. Two years ago this was a very helpful suggestion. The Action Bar provides a nice framework for the user interface of the App. I couldn’t help noticing the professional icon that my friend’s App had. When I asked where he got the icon, he was happy to provide a referral to a designer. I ended up hiring this designer to create the icon for Eco Trip. Your App icon is a key part of the design. Make it easy for users to email you from within the App. In my experience, users will be glad to hear from you if you reply to their emails in a timely manner. It is a chance to show them that you are not some Big Co. If you fix a bug or end up implementing one of their feature suggestions they will usually be grateful. This is a good time to mention that they can help you by giving a positive review on the App store. Once you ship the initial version(s) of your App you can let the development be guided by user suggestions. You should pay special attention to repeated requests. Keep in mind that bells and whistles cost money (or in the case of your side project, time). There is no end to human creativity and the number of possible features that could be added to an App is almost infinite. That is why it is a good idea to filter requests to look for things that will benefit all users of your App as opposed to a one off feature to fill a unique use case. I have shipped 15 updates to date for my most popular App, Email Sign Up. These updates were largely in response to feed back from people that actually use the App. I think the App is much better than what I would have come up with by myself. Writing Android Apps is exciting. Once you start your app start talking to people. You never know who will be able to make helpful suggestions. You may even find referrals from friends and colleagues. You can also let users guide the development of your App by paying attention to their feature requests. 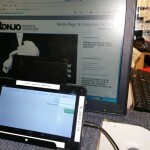 Using an Android tablet to collect email addresses. See how one store owner is running the Email Sign Up App on an inexpensive Android tablet in his retail store to replace his paper sign up form. You can read about it in the second case study. It details how Ron of ronjo.com uses the App to collect names, email addresses and phone numbers.